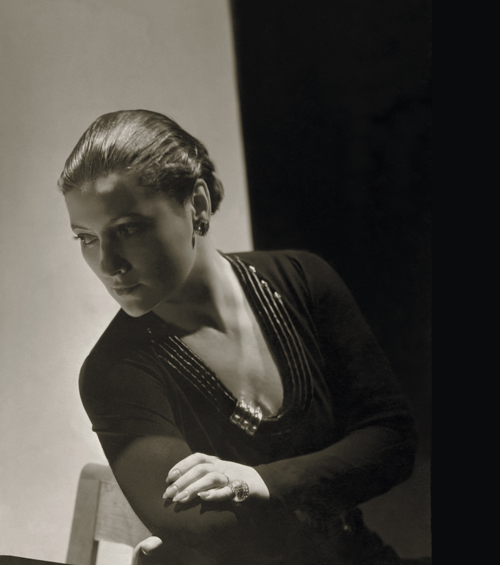 Standing apart as the only woman in the pantheon of master jewelers of the era, Suzanne Belperron was one of the most influential designers of the 20th century. 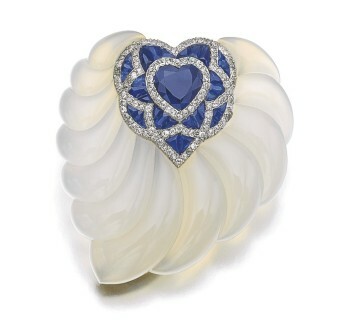 Being legendary and glamorous figure in the world of French jewelry for many decades, she created her elegant, sculptural and masterfully crafted designs. 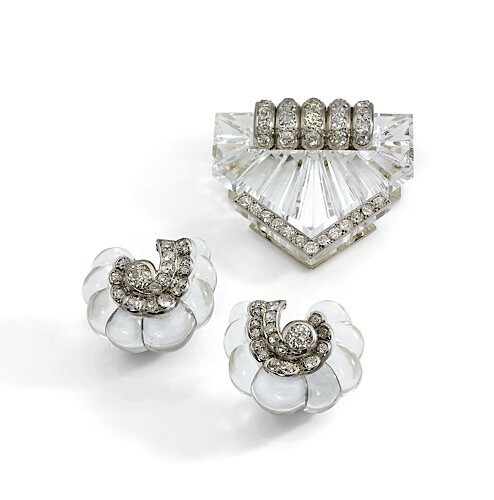 Beginning as an artist, model maker at famous company Rene’ Boivin, she left it in 1933, establishing a highly successful collaboration with a well-known precious stone and natural pearl dealer Bernard Herz. Under Herz Belperron achieved great success and gained an elite following. Her sophisticated clientele was part of beau monde, including gorgeous Diane Vreeland, Elsa Schiaparelli, Aga Khan, Collette, Daisy Fellowes, Fred Astaire who frequented Belperron’s fabulous boutique at 59 Rue de Chateaudun to view her remarquable creations. Needless to note among them a high society representants-Duke and Duchess of Windsor-perhaps her greatest patrons. 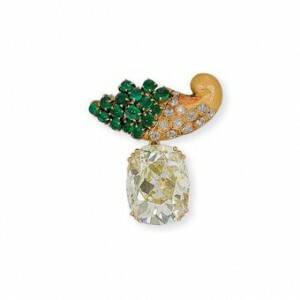 In fact, it was after the auction of the Duchess of Windsor’s jewels in 1987 the Belperron’s name was once again in the spotlight. 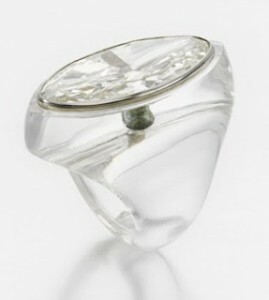 Carved rock crystal ring inset with large navette diamond, Suzanne Belperron, 1932-1955. Sold for 464,500 CHF at Sotheby’s in Geneva. 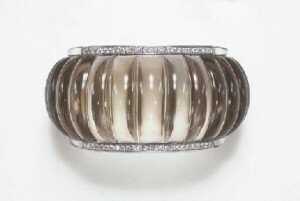 Attractive rock crystal and diamond brooch, Suzanne Belperron, 1932-1955. Sold for 302,500 CHF at Sotheby’s in Geneva. Suzanne Belperron always insisted “My style is my signature”. She has never signed her inimitable pieces believing they were recognizable. Her style was highly imaginative and distinctive, drawing inspiration from far flung cultures like Egypt, Africa, India and the Far East, as well as among nature and the underwater world. Combining chalcedony, white and black onyx, rock crystal, jade and coral with precious stones she created undoubtedly miniature works of art. Her voluptuous and architectural pieces were identifiable only by her exclusive manufacturer’s mark, Groёne et Darde. 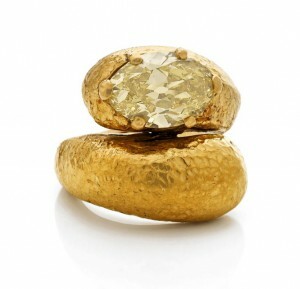 Ying yang ring set with a rare vivid yellow diamond, Suzanne Belperron, 1923. Sold for €217,500 at the Artcurial Monte Carlo auction in July 2013. 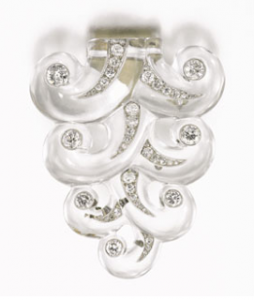 On the occasion of the relaunch of new Belperron company headed by Nico Landrigan, the son of former chairman of the jewelry department at Sotheby’s Ward Landrigan, fifty new pieces of Belperron will be showcased alongside fifty vintage jewels. 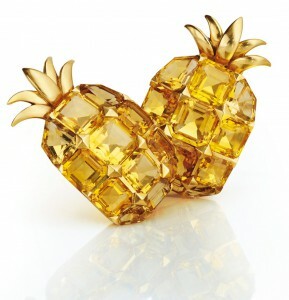 So if you happen to find yourself close to Fifth Avenue, be sure to pay a visit to the fascinating boutique. Suzanne Belperron’s work is timeless and appears as fresh today as it did in 1925. Her remarkable career, spanning more than fifty years left a legacy of some of the most inspired and influential designs of her century. An incredible achievement and one that is unlikely to be surpassed. 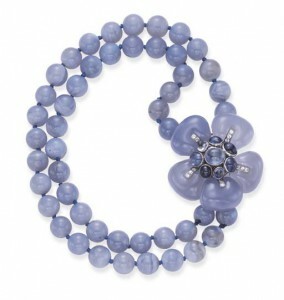 Chalcedony bead and sapphire necklace, Suzanne Belperron. 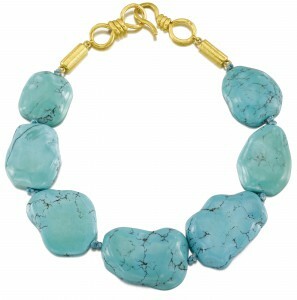 Gold and turquoise necklace, Suzanne Belperron, 1955-1970. Sold for 45000 CHF at Sotheby’s in Geneva.